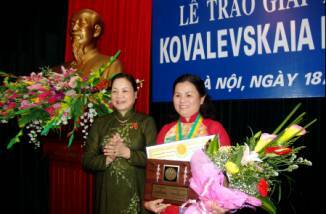 The Kovalevskaia Awards 2005 went to a doctor of the Ministry of Agriculture and Rural Development and a group of staff from the Viet Nam Institute of Science and Technology. The awards, made in recognition of females whose scientific studies are highly practically applicable, were presented to the recipients at a ceremony in Ha Noi on May 18. The Petrol Microorganism Department was also honoured with the prestigious award for their contribution to the containment of microorganisms' detrimental effects on the preservation and exploration of oil and petrol. After 15 years of operation, the department has carried out five projects at the central level and 19 studies at the grassroots levels. It has become the first unit in Viet Nam able to collect data on microorganism fauna in oil wells and petrol products, bringing solutions to address environmental pollution and improve the preservation of petrol products. Over the past 20 years, the Viet Nam Kovalevskaia Fund has presented awards to 28 devoted individuals and 12 scientific research teams. Present at the award ceremony were Nguyen Thi Binh, former State Vice President and Chairperson of the Viet Nam's Kovalevskaia Award Committee, and Ha Thi Khiet, President of both the Viet Nam Women's Union and the National Committee for the Advancement of Vietnamese Women.